What is downhill mountain biking? An adrenalin junkies dream, downhill mountain (or DH for short) biking is arguably the most exhilarating form of off road cycling. Riders exhibit their extraordinary handling skills as they descend at high speeds down steep trails. The aim is simple: get the down the course as quickly as possible. For anyone who has ever done downhill skiing, downhill mountain biking has some similarities such as the difficulty of the trails often being colour coded with green being for novices, blue for intermediates and black for experts. As you descend down these courses you will have to watch out for obstacles such as rock gardens and jumps. Whilst for a beginner downhill mountain biking may seem scary, the trails for first timers have much easier terrain with fewer bumps. It must be remembered that the frighteningly fast and dramatic downhill descents you see on Youtube are often done by pros who are the best in the world, with the downhill courses near you likely to be not as daunting. At any downhill club there will always also be a support structure available to provide advice to allow you to progress at you own pace. Once a newbie gets over their initial fears, they will find that downhill mountain biking can be extremely fun and addictive. This form of cycling also does not require an immediately high level of fitness for starters, although one’s focus and concentration will be tested and the descents will still provide a physical test. The most common types of bikes used in DH tend to be heavy, strong full suspension bikes that can hold up under intense pressure with the brakes, gears and wheels all designed to cope with tricky terrain. On some courses you may be allowed to use your cross country or mountain bike, but it would probably be best to rent a downhill bike as you will be able to do at most trails. Although the dangers of DH will be minimised by a beginner who is responsible and does not take on too much too fast, there are still a number of precautions one should take to prevent injury from a fall. Body Armor will be need with fully padded jackets being required along with gloves, shoulder protection, knee pads and elbow pads also likely to be need. Full face helmets will also be necessary and eye protection is strongly recommended. Just as you will likely be able to rent out your downhill bike, you will probably be able to rent out most of the other equipment. Some information on what equipment is required can be found here. How and where can I get involved? 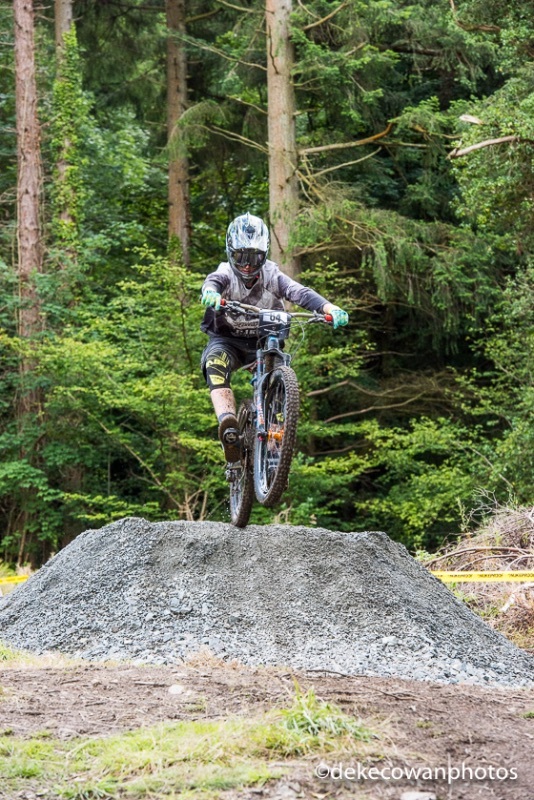 The Irish Downhill Mountain Biking Series is the national DH series in Ireland which has four rounds with numerous catagories ranging from juvenile to veteran (50+). The next round is taking place in Co. Wicklow on the 30thSeptember and 1st October. You can also find your nearest club that caters to cyclocross using the club locater here.